Food Review: Aristocrat - NCHS Live! If it was not for the trees outside and the lack of accents in the voices of the patrons, I would have thought I was in a pub in England. The Aristocrat, at 52nd St and College, is an American restaurant that is designed to look like an authentic pub from England. Aside from the decor, pictures of presidents and drawings from 1800s America, the place genuinely looks like a pub. The wood and carpet interior matches that of any pub in the UK. The food also reflects that goal. The service is stellar, as the staff are orderly, punctual and friendly. With the root beer coming out in full German-style mugs, they are draft root beers. That means that these were professionally made. The menu contains many American dishes, with several different types of burgers, but it also includes British staples, like Bangers and Mash and Fish ‘n‘ chips. Speaking of the fish ‘n’ chips, they where not all that bad. The fish was evenly battered, the tartar sauce went well with fish and the fries dipped in the sauce were delicious. 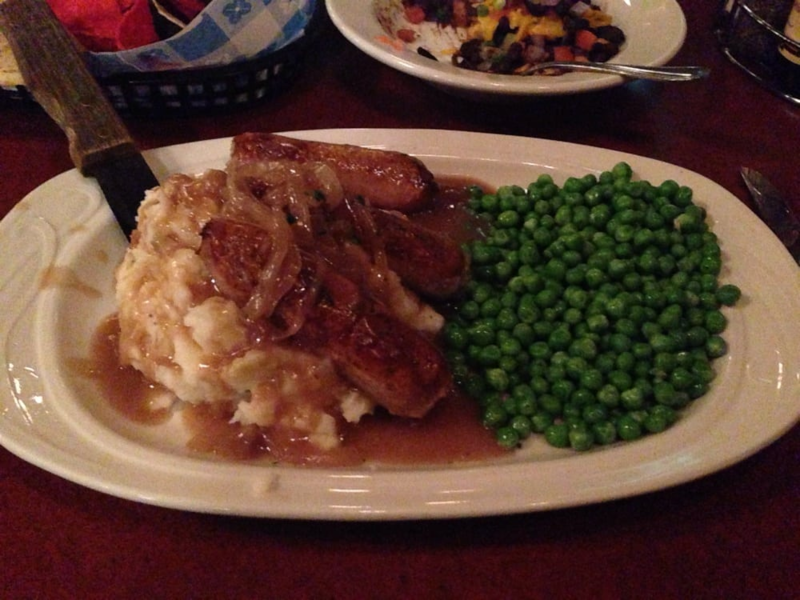 For those that are uninformed, Bangers and Mash is British slang for mashed potatoes and sausages. This is also a British staple. With the gravy and the mash mixing, I have never had a better Bangers and Mash outside of England or my house. The non-British dishes are not that bad, though. Aristocrat has several different types of salads, like the usual Caesar, and more unusual and unique choices, like the strawberry salad. The salad consists of chicken, cooked how you like, with lettuce, strawberries, blue cheese, sugared walnuts and strawberry vinaigrette dressing. As it is with many salads, there could be less green. There is so much that even if you mix the lettuce with the toppings, there is still too much lettuce left.